Pho | Restaurants of the World Unite! I can’t possibly keep up this punishing pace. I’m a terrifically lazy person and also feeling the economic pinch. I should have challenged myself to build dinosaur skeletons from a year’s worth of my nail clippings. But your selfless adventurer won’t back down. I just won’t. Well, not until I decide to tackle the sticky matter of Andorran cuisine. 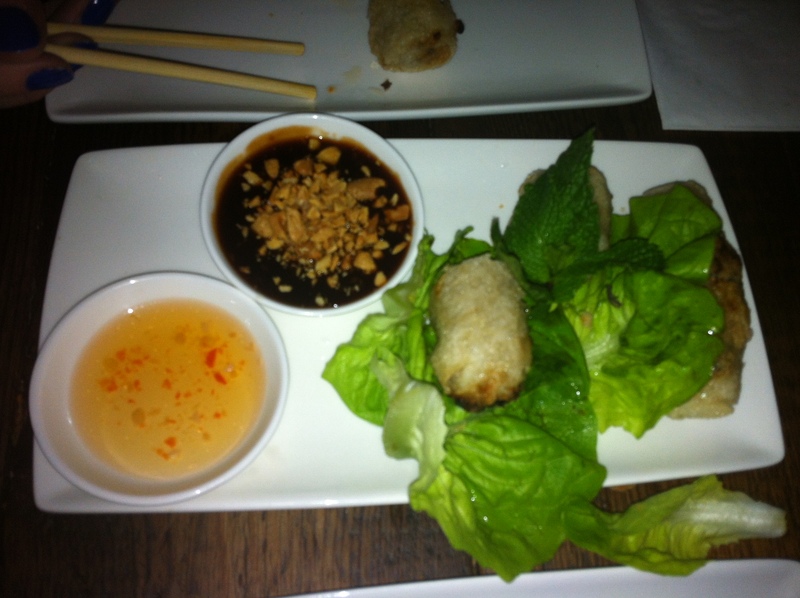 I love me some Vietnamese spring rolls. 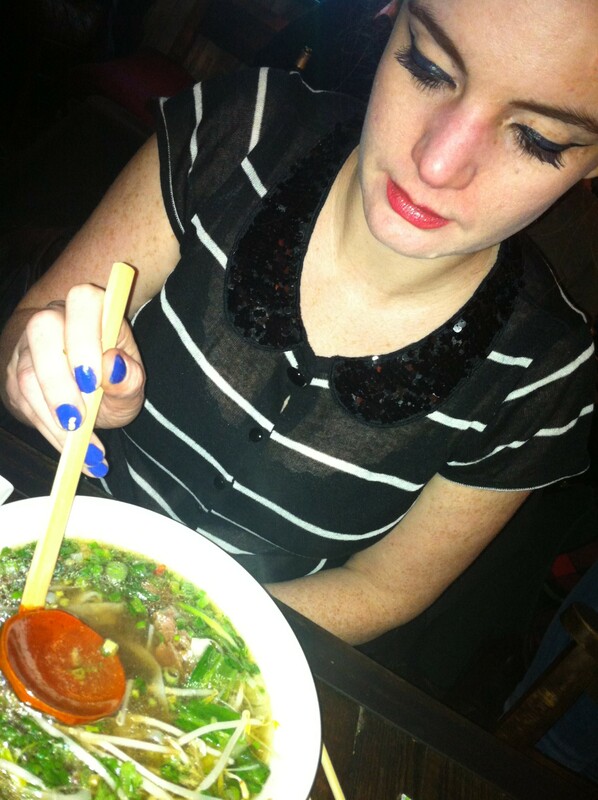 Vietnamese noodle soups are excellent, so me and my bustier half found Pho near Spitalfields (http://www.phocafe.co.uk/ – a chain) after some swing dancing (that’s how I roll) and thought we’d Pho ourselves stupid. The atmos and lighting is awesome and it’s the sort of place where I’d like to spend hours uttering witticisms or wittering utterances. Still on the wagon and I wanted to neck a frosty Hue beer. But couldn’t. The main event for me is the spring rolls. Having eaten a LOT of spring rolls in Vietnam, these ones came very close to recreating the unsightly gorging which got me ejected from many restaurants in Hanoi and Ho Chi Minh City. The pho noodles, its specialty, were hearty and hit the spot on a chilly evening. The staff were exceptionally friendly and more than deserved the 12.5% discretionary service charge, my stated objection notwithstanding. £23 for 2 people. With no booze. Still. I’ve taken to sucking Cointreau out of liqueur chocolates. I ate dog on one occasion when in Hanoi. It was in season (like sakura nikku, I have no idea what dog season is. Unless it’s the same as the dogging season: All year round! Am I right?!) We shanghaied a taxi driver to take us to a specialty dog restaurant north of Hanoi. Though we didn’t speak the same language we did share his love of marinated puppy flesh, so we managed to get him to order for us. It was a fancy place. Fresh newspaper on the table, only a few scattered vertebrae under the chairs and the yelps of puppies almost entirely obscured by the stunned silence of our fellow diners. Dog steak I’d eat again. Dog soup, not so much. And why they felt the need to add peanuts to the dog sausage is beyond me. Our taxi driver snaffled it all up though. There’s a bunch of excellent Vietnamese restaurants on Kingsland Road near Hoxton, but that end of town is rank with hipsters, with their ironic tattoos and non-matching socks, so I won’t be going back until they’ve all pissed off out of Dalston. 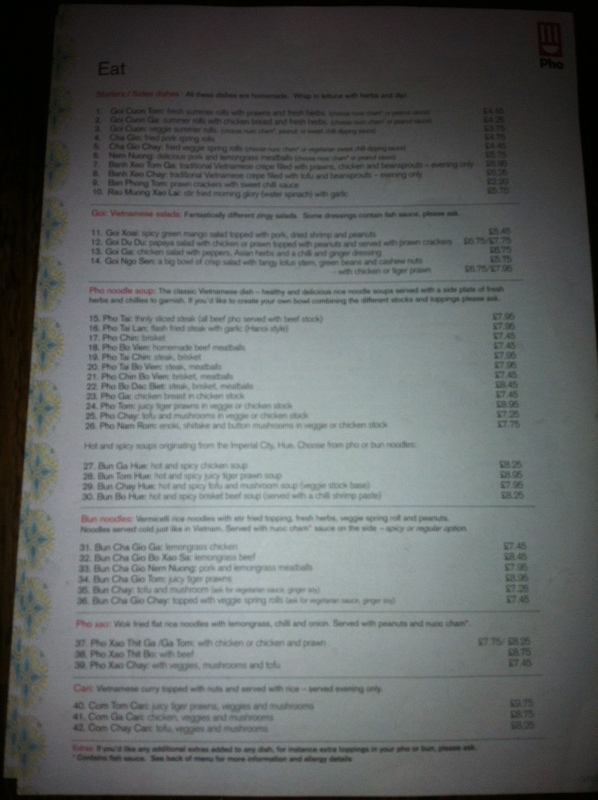 I really like Viet Pho Noodle Bar on Greek Street, but if I remember rightly they don’t serve booze. If you’re into that sort of thing. 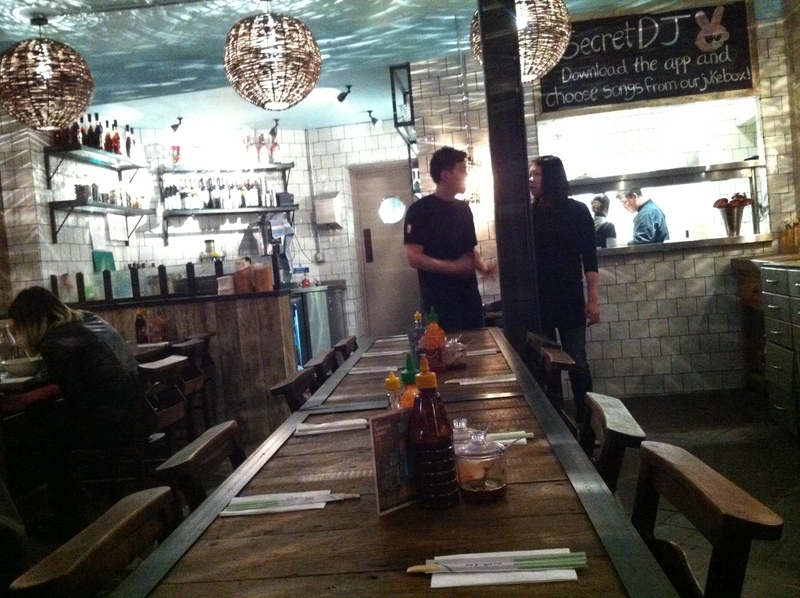 Pho interior. I know what you’re thinking: “How professional a photographer is Charlie!” Never had one lesson. 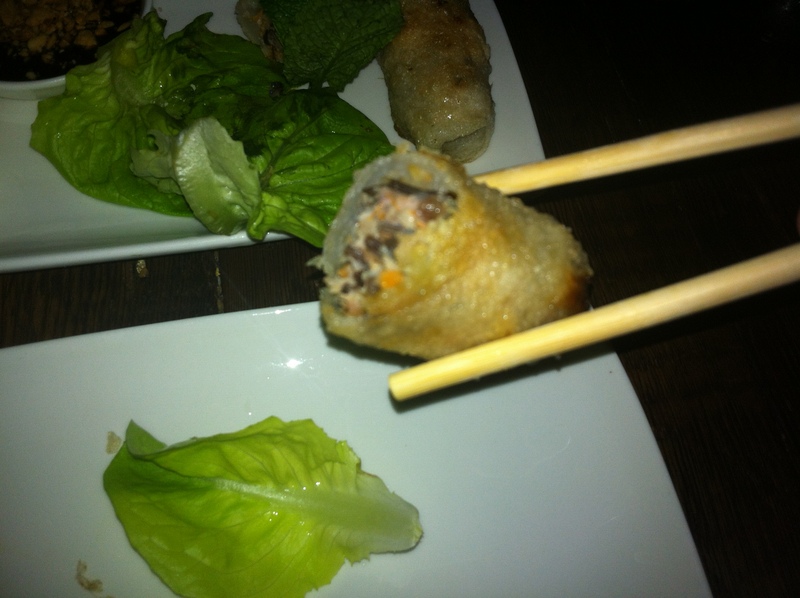 Inside a deep fried pork spring roll. Where I always want to be. The pho noodle soup. And faux ladle. Look at that thing, Useless. 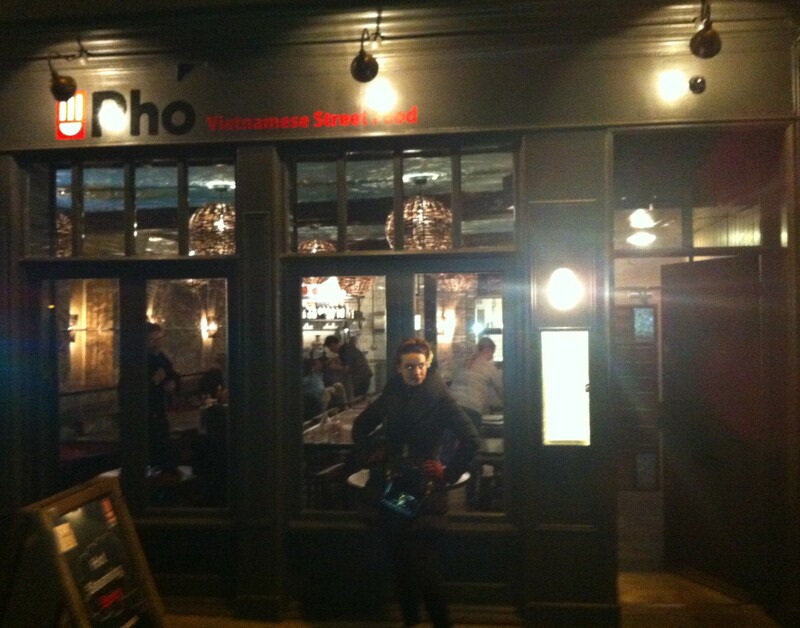 Pho Vietnamese “Street” Food, suspiciously inside and not on the street.